alaTest har samlet og analyseret 83 anmeldelser fra magasiner og hjemmesider. Anmeldere kan virkelig godt lide størrelsen. Også designet imponerer, men pålideligheden værdsættes ikke af anmeldere. Vi analyserede bruger- og ekspertratings, produktalder og andre faktorer. Sammenlignet med andre Stationære Computere får Lenovo IdeaCentre AIO Y910 en samlet alaScore™ på 95/100 = Fremragende kvalitet. 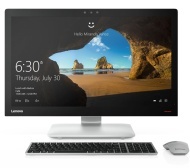 A smart and flexible all-in-one computer – the Lenovo Ideacentre AIO 910 is a great all-rounder. Our Lenovo IdeaCentre AIO Y910 review takes a look at an all-in-one solution with top-notch specifications that is excellent for gaming with a more compact footprint. Sleek design, great performance. Easy to access internals for future upgrades. Crisp display with small bezels. The speakers definitely need work as even though they are loud, they lack bass and sound flat most of the time. Included keyboard and mouse aren't really gamer quality. An overworked, noisy cooling fan and so-so performance sidetrack this slim, 27-inch system's quest for AIO greatness. We think Lenovo has really nailed the essence of a gaming all-in-one with the Ideacentre AIO Y910. It can be just as powerful as a good mid-tower, thanks to its desktop-grade components, something that only a handful of AIOs can claim. The Lenovo IdeaCentre AIO 910 is an all-in-one with strong performance and a vivid display that bends to any angle you like.